My family and I spent Thanksgiving in San Diego with my mother and Kirk's daughter who both, coincidentally, happen to live there. There's 1100 miles between my door and my mother's. That's a lot of time in a confined space with an 11-year old. I've made this trip before. Several times in fact. The first time, I was actually living in San Diego, and several friends had assessed my Birkenstockishness and hippie outfits claiming me perfect for the Pacific Northwest. At the time, my older kids were babies, so on a lark (truly, it was...I didn't even have Triple A!) I packed the wee kids up and headed north. At some point I thought to look at a map and, lo and behold, discovered that Oregon (which I then pronounced the you-ain't-from-around-here way, emphasizing the GHAN syllable) lay between California and Washington, instead of next to Canada. Really, I was that stoopid! On that adventure, I fell in love with Portland, and promptly U-Hauled my crap up here. I've never looked back. Except during Thanksgivings, summers and the occasional Spring Break, where occasionally I'll be moved to get an oil change and I-5 my way down the road. 1100 miles is sixteen hours of driving. Kids, even good ones, get whiny and bratty after about two. That's my experience anyway. But this trip was different, and I owe it all to Jordan Sonnenblick. Before we discovered this amazing writer, the only use my son had for books was to include them in the creation of make-shift bowling alleys. As a person whose life turns on the printed word, I tried to disguise my disappointment in his disdain for reading. I tried to introduce him to graphic novels, sports figure books, skater magazines. No go. 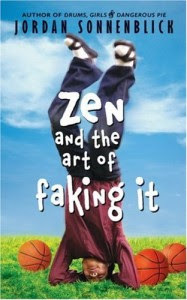 So, one day, on yet another one of my famous larks, I perused the YA section of our neighborhood library and, judging one after another book by its cover, stumbled upon Zen and the Art of Faking it . It grabbed me. It had all the elements: an upside down boy who looked about my son's age. Basketballs. Oregonesque sandals. I checked it out, took it home, and my son actually began to read it. And not put it down. (Until his myriad sports practices required it). I promptly ordered up the book-on-tape version for our trip. By the time we climbed into the car, my son was a good three quarters of the way through the book, but was delighted to hear it read to him, and to have us brought up to speed so we could have a little mini book group whilst crawling up the I-5 post-Thanksgiving. 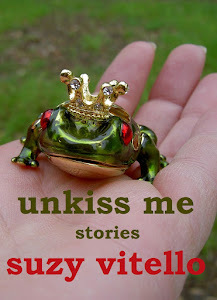 Some of the unexpected takeaways included my son divulging long-held secrets from grade school, feelings about bravado, teasing, crushes, sports acumen. In short, the trip was delightful, entertaining, informative and easier than ever. So. This summer? Maybe the canyon lands and more excellent spoken YA coming out of the dashboard. You will especially love it since you are a (former?) "hippie" yourself. Great tip! Yes, I am determined to ride the Sonnenblick rainbow, given my son's enthusiasm for his voice and style. With Christmas break coming, we need to fill the hours with other than ball-bouncing and video games! Thanks so much for this lovely write-up, but just so you know: I didn't write SCHOOLED. My friend Gordon Korman did.